Before the UK joined the EU (or rather the EEC as it was called at the time), it was a member of EFTA, and when Norway twice voted No to joining, they remained in EFTA. Because of this, I think many people think that it would be easier for Scotland to join EFTA than the EU after independence. It’s not as simple as that, however. 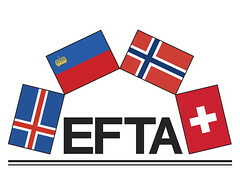 EFTA consists of four countries: Iceland, Liechtenstein, Norway and Switzerland. EFTA was originally a rival to the EEC, but today it basically contains a few countries that never joined the EU for various reasons. The EEA (the European Economic Area) consists of all EU countries plus Iceland, Liechtenstein and Norway. It is the area in which the Agreement on the EEA provides for the free movement of persons, goods, services and capital within the European Single Market. All EEA countries adopt most EU legislation concerning the single market, however with notable exclusions including laws regarding agriculture and fisheries. The EU Customs Union (the EUCU) is a customs union which consists of all the member states of the European Union (EU) as well as Turkey (apart from agricultural goods) and a few micro-states. The EFTA countries do not form part of the EUCU. When people talk about joining EFTA, they probably mean joining the EEA, too (like Norway) – I don’t believe there are many fans of the Swiss solution in Scotland. It makes sense to think of EFTA + EEA (the Norwegian/Icelandic solution) as being a reduced version of the EU – it basically means being part of the Internal Market, but being in charge of trade agreements, agriculture and fisheries yourself. Also, EFTA/EEA countries don’t take direct part in the EU’s decision-making processes (no members of the European Parliament, no European Commissioner, no EU employees, and so on). If Scotland were currently a fully independent country, it would make perfect sense to join EFTA/EEA as a stepping stone to full EU membership. It would basically mean joining in two rounds instead of one, which might be easier for people to adjust to. However, Scotland is not a fully independent country, and neither is the UK. We have been part of the EEC/EU for fully 44 years, and that changes everything. If Scotland went for a Norwegian/Icelandic solution after independence, we would need to develop policies for agriculture and fisheries from scratch, and we’d need to set up trade deals, customs schedules, WTO membership, and many more things. Many of those things would take a very long time to set up – the standard assumption is that new trade deals take about a decade to negotiate. Incidentally, this is one of the reasons why Brexit is likely to become such a disaster — Westminster simply cannot set up these things quickly enough, so without a ten-year-long transitional period in place (which they’re refusing), the UK will fall back on the WTO’s standard terms, which will be disastrous, not least for agriculture. In other words, if the people of Scotland wanted a proper Norwegian solution, it would probably take about a decade to set up after independence. During that decade, it would be really important for Scotland to remain inside the EU’s Customs Union. By the way, it might be worth pointing out in this connexion that most Norwegian and Icelandic politicians don’t really like the EFTA/EEA solution. They can live with it, but they’d rather be in the EU. The main reason why Norway never joined the EU is because they’ve decided to spend a lot of their oil money on keeping their villages full of people, which implies subsidising their farmers (and keeping food prices higher) than the EU would allow. Iceland is so dependent on fisheries that it overshadows everything else; however, they’re now talking again about joining. Anyway, back to Scotland. It’s quite possible that the EU will require us to apply for membership formally after independence, and although this is likely to be the fastest application process ever (because Scotland already ticks all the boxes for membership), it could still take a year or two. If Brexit happens a few months after the Scottish Referendum, we cannot be in limbo for that long. So Scotland should aim to to get membership of the EEA and of the EU Customs Union as a matter of priority after independence (hopefully it can be pre-negotiated informally beforehand). Membership of the EEA and of the EUCU is not the same as the Norwegian solution, and it doesn’t really require membership of EFTA, either. Once Scotland is a member of both the EEA and the EUCU, time is not of the essence any longer. We can afford to discuss membership terms with the EU in great detail, including getting a much better deal for the Scottish fishermen than what Westminster got, and if the deal on the table isn’t good, Scotland can look at negotiating its own trade deals and eventually leave the EUCU a decade or more after independence. I’m perfectly happy for us to aim for EEA + EUCU membership as a stepping stone to EU membership, but we shouldn’t call it EFTA membership or a Norwegian solution, because it wouldn’t be. Once we’re independent, it will be right and proper for the Scottish Parliament to discuss the pros and cons of EU membership versus mimicking Norway, and perhaps we should even have a referendum to settle the question. However, we need EEA + EUCU membership in the meantime. Doing the same as Norway might be possible eventually, but it wouldn’t be a quick and easy solution, because we would need to develop policies for trade, agriculture and fisheries first. I believe full EU membership would be much better for Scotland, but I’m quite happy to postpone this discussion till after #ScotRef. What is important at the moment is not to start aiming for a Norwegian solution already because we think it will be easy. Negotiating trade deals is extremely complex, and we shouldn’t leave the EU Customs Union without a full and frank discussion of the consequences. What we should do is to aim to remain inside both the EEA and the EU Customs Union from Day 1, and then decide what we want to do. I hope and expect the EU will offer such a good membership deal that the choice will be obvious, even for Scotland’s farmers and fishermen. Good post Thomas. The points about the difficulties of leaving the Customs Union are spot on. It is amazing how many people just ignore the serious difficulties negotiating trade deals from scratch will be. Full membership of EU is the best outcome for Scotland. I don’t think it’s that, I don’t think people fully understand the differences between EFTA and EEA and EUCU. This is the type of detail that needs to be widely disseminated, but isn’t. Hmmm. Could it be a problem if there is no feasible compromise position between regional UK status and EU membership? We do so much more trade with rUK, which I understand could be badly harmed if there’s an EU border with England. e.g., if the nightmare scenario of “crashing out of the EU” happens. Would EEA membership let us mitigate that? Maybe there’s no good indy option with rUK out of the EU. It’s a good question. Everything would be much easier if the rUK were going to remain in the EU (which is what we assumed during the first independence referendum). The real problem is that the rUK doesn’t have any trade deals either, so joining them in their misery won’t be much fun. This is quite different from the hypothetical situation where the UK had left the EU in, say, 2001 and had built up a decent trade regime by now – in that case, there would have been a case for joining EFTA instead of the EU and remaining in a customs union with the rUK. However, because the UK will be desperate to form new trade deals, they’ll have to take whatever the EU offer them, and this will thus be a deal that is great for the EU (but not necessarily for the UK). This is likely to be a much better deal than what the rUK is likely to offer Scotland in a situation where we’re trying to set up new trade deals, too, and where we’re even more desperate than they are. I would therefore strongly recommend staying within the EU Customs Union for a the foreseeable future, and lobby the EU to allow for tariff-free trade with the rUK with regard to whisky, oil, beef and other areas that are really important to Scotland.